Description: Wingspan 26-34 mm. Adult colouration can show some variation within individual populations. Forewings are normally reddish brown with white stigmata and crosslines, but some individuals can have a mottled greyish appearance. 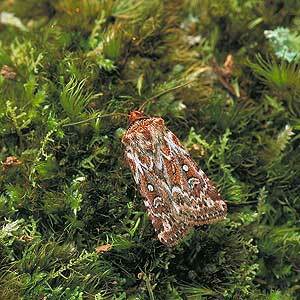 There are small pale streaks near the outer margin of the forewing. Hindwings whitish brown with darker veining. Flight Period: Mid-May to early September. Status: A common and widespread species throughout N. Ireland which has been recorded on Rathlin Island. Ecology: A familiar species of upland and lowland heaths and bogs. Adults appear frequently at light in moderate numbers and also visit flowers, particularly Heather Calluna vulgaris. Although mainly nocturnal, it can occasionally be found in late afternoon. The larvae feed from August to May of the following year on Heather and Bell Heather Erica cinerea. It overwinters as a larva. World Distribution: Throughout Europe reaching the Arctic Circle and south to northern Spain.